I took my empty glass to the kitchen to get something to drink. Or, anyway, that was the idea. I put the glass on the counter and looked at the plant hanging on the kitchen window. It needed some water. Maybe they all (finally) needed water. I left the drink where I’d stood it. Filled the little red watering can, then thoughtfully dribbled water across the kitchen floor while getting my socks thoroughly wet at the same time. I am nothing if not graceful. I watered — finally — the two Christmas Cacti and all the other plants, including the budding orchids and the big Philodendron. Emptied out the rest of the water while dousing my feet a little more. I turned around and said “Oh,” because there were birds. 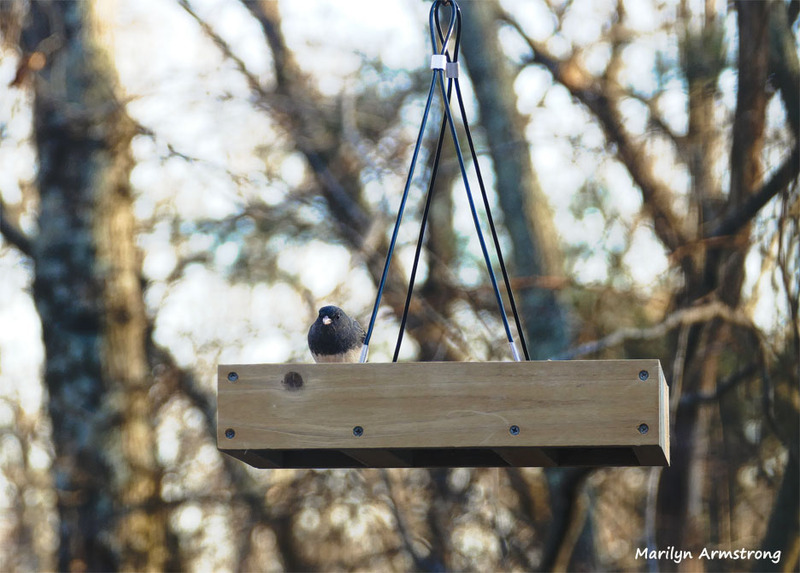 One squirrel in the flat feeder — and maybe a dozen birds fluttering and a few more striding the deck. Some new ones, too. 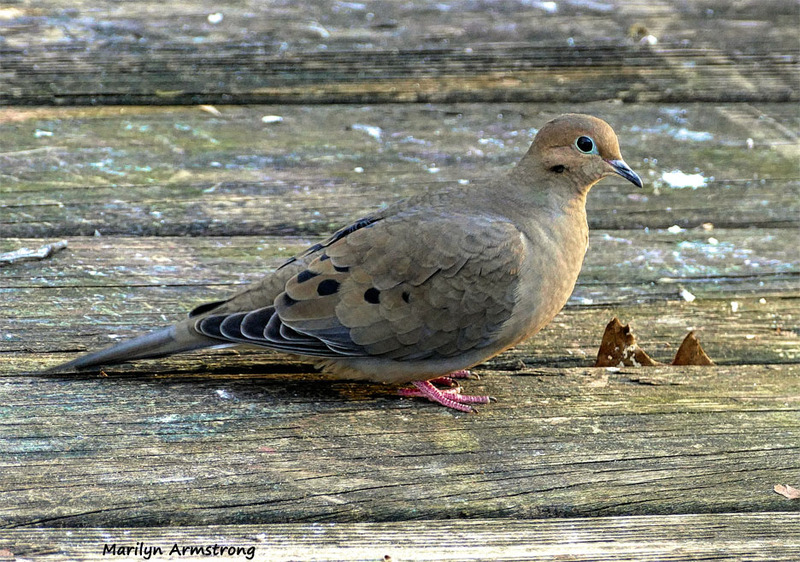 Mourning doves were on the deck, picking up pieces of seed the birds had tossed aside. Also, I saw a few Slate-Colored Juncos. Those are the strutting birds who clean up anything let by the flying birds and the “stuffing her face” squirrel girl. Suddenly, all other thoughts were forgotten and I found myself taking pictures of birds. I couldn’t help myself. As if I’d been hypnotized, the fluttering birds were waiting for me. 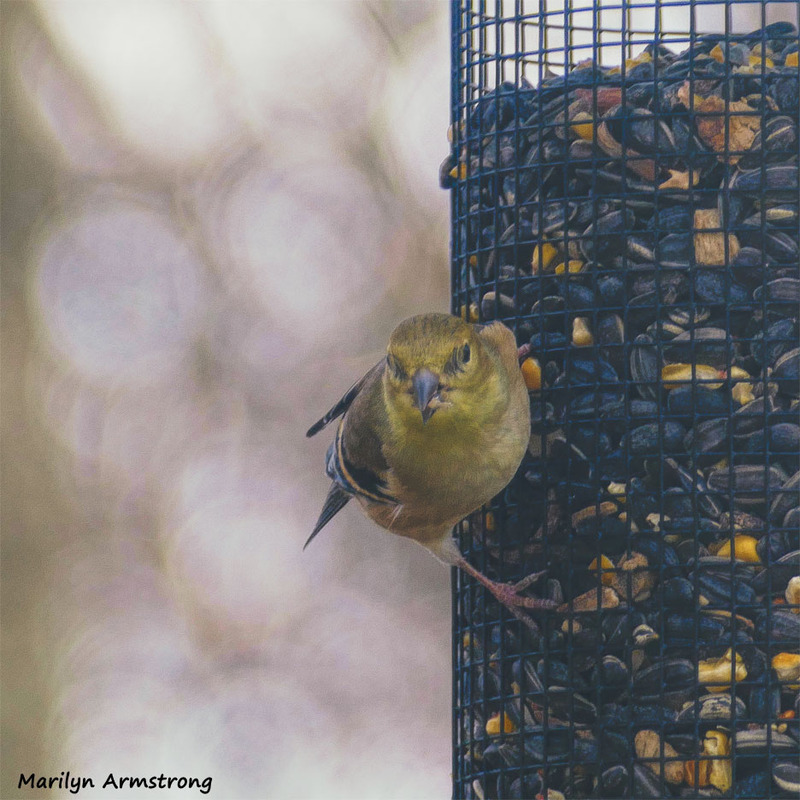 On the deck, on the feeders. 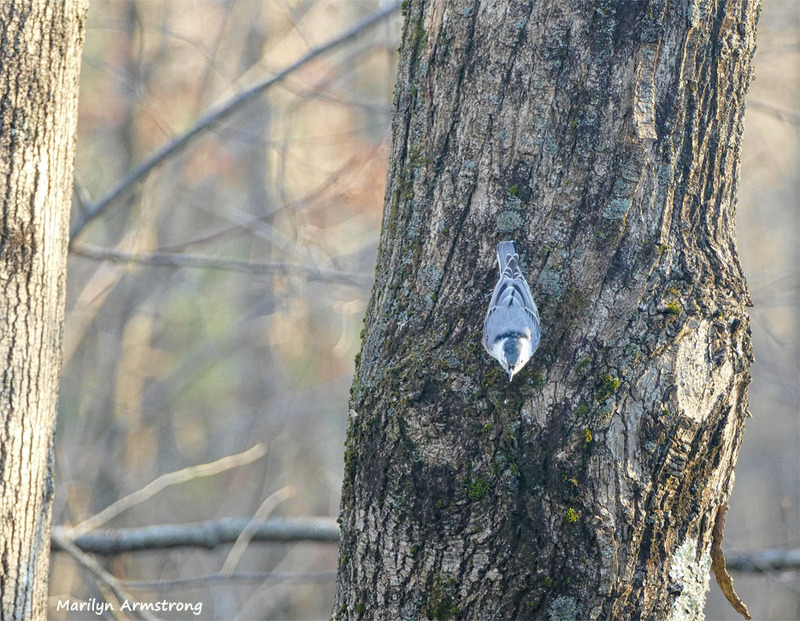 Far in the woods, I saw a big red-headed woodpecker. I couldn’t get a picture — he was outside the range of my lens. I just got a flash of him in the trees. He was a big one! I noticed new birds — a dark-headed, white-bellied bird with dark eyes and a white beak which I finally decided had to be a Slate-Colored Junco because he was the only bird in the book the looked remotely like him … and the Gold Finch that had to be a Gold Finch even though all the finches should have already flown south. He had to be one anyway because there was nothing else he could be. Garry pointed out that we’d had a lot of storms and birds do get blown off-course. I have ascertained that when you are trying to figure out what a bird is, especially when there are a lot of birds that look very similar to that bird, after you have eliminated all the birds he or she cannot be, then he or she must be whatever remains as long as it bears some resemblance to the image you are staring at. You would think, if you have a clear photograph of the bird and you know where you are, it should not be that difficult to figure out what bird you are looking at. You’d think that but you would be wrong. Or at least if you are me, you’d be wrong. There is a section of my “Peterson Field Guide to Eastern Birds” called “Confusing Fall Warblers.” They come in yellow, green, beige and many variations in between. Some of the birds interbreed too, so there are many variations on the variations and even though they are all supposedly gone from this area by now, the weather hasn’t been normal and neither have the birds. 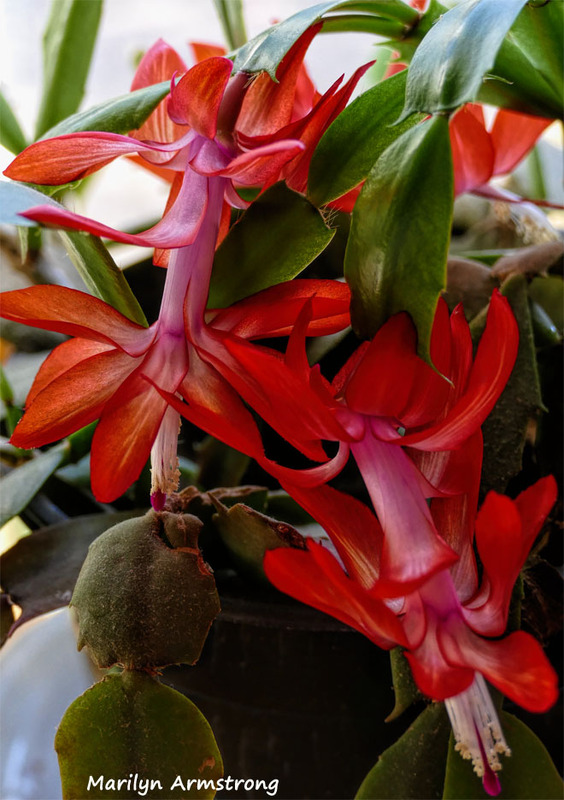 I had to take the SD chip and stick it in the computer to see what I’d gotten and while I was at it, process some very pretty pictures of the blooming Christmas Cactus. That was when I realized I was still thirsty and my glass was still on the counter in the kitchen and my feet were wet. Birds. I’m totally hooked. Just as well, because if it weren’t for the birds, I’d probably be watching the news. There can never be too many birds — or red Christmas cacti either, for that matter! This is a delightful post — I’m glad you were distracted from the news! I felt I had to write about the events that have occurred because they matter, but i like the birds a LOT better. You really have a variety of birds in your area. They seem to have their particular times for a feed. We are something of a crossroad between southern (wintering) birds who fly across us to go to Canada. Lately, more of them have not bothered to finish the flight and seem to have decided we are quite cold enough. You have (usually) fewer birds when you are at either end of a migration route unless you live in a warm place where there are simply a LOT of birds. 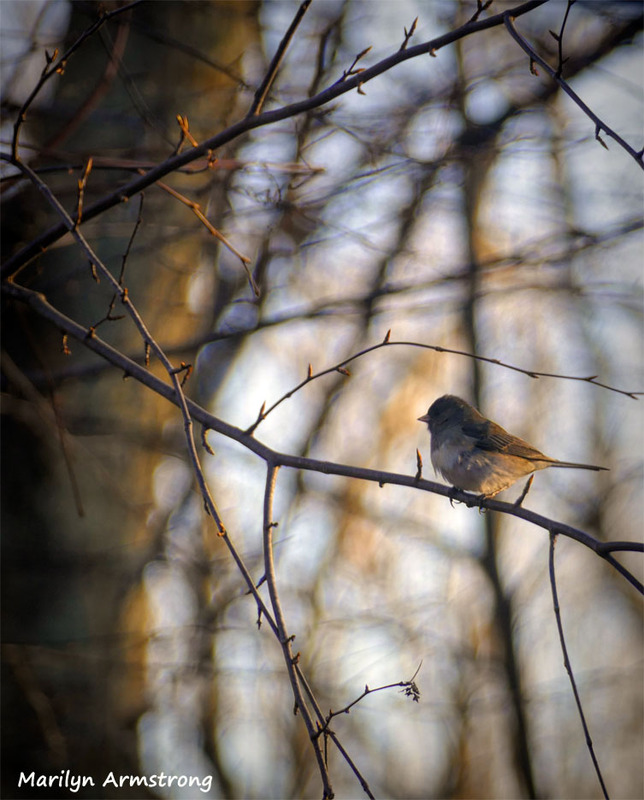 The Juncos stay all winter- and leave come spring. As soon as I saw one last month I knew winter was arriving! We’ve got two kinds — the dark-eyed and the one with the white beak. Some of them hang around all year these days. The seasons are funky and the birds aren’t always migrating. Marilyn, you are the BEST! You are not yet there where I was when I tossed aside my 2 quite detailled bird books in the UK…. because I just couldn’t – for the life of me – make up my mind on any of them! So they stayed from that moment on – ‘just lovely birds’…. And bird watching is SO preferrable to watching the news…. We just have to wait for Stephen Colbert – that will do nicely! Yes. I’m pretty sure that woodpecker would make a great senator, too.